In 1969, a 21-year-old Joshua Jacobson, along with his buddy, Lou Garber, turned his passion for Jewish music into a vision that few could have imagined at that time, the Zamir Chorale of Boston. Fast forward nearly five decades later—Zamir, performing on stages across Europe, Israel, and North America, has achieved the distinction for setting the bar for Jewish musical excellence and innovation, with its mission: To bring the joy of Jewish music that transcends age, religious and ethnic background to audiences throughout the world. Zamir has remained committed to the highest quality performance of music that spans thousands of years, four continents, and a variety of styles, both popular and classical. Josh Jacobson, an award-winning conductor, is now considered to be one of the world’s leading authorities on Jewish choral music. 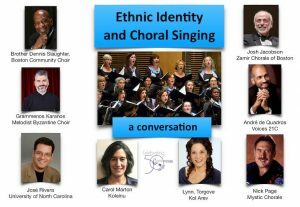 Zamir celebrates its 50th year of touching people’s hearts in the 2018-19 season with programs and initiatives that will enhance Zamir’s legacy for the future, recall past accomplishments and launch new initiatives to continue Zamir’s reputation as “America’s foremost Jewish choral ensemble” (American Record Guide). Creation of a first-ever international virtual choir using Louis Lewandowski’s great “Halleluyoh,” performed by hundreds of singers from around the world and capturing a Jewish musical gem that can be seen across the globe and preserved for years to come. A Cabaret Reception kicks off the 50th season on Thursday evening, October 11, 2018, at Newton City Hall, premiering the “Halleluyoh” Virtual Choir, and delighting in food, drink, and a few of Zamir’s favorite selections. An in-depth, web-based resource for any musical professional, conductor, singer, scholar, or music lover looking for choral music connected to the Jewish traditions. Cataloguing these works is Zamir’s way of sustaining a precious cultural heritage. A gala concert at Sanders Theatre in Cambridge, Tuesday, June 4, 2019, honoring Josh Jacobson, and showcasing the best of Jewish choral music, drawn from five decades of concertizing, and a look to the future. By featuring newly commissioned works from composers Jeremiah Klarman, Ken Lampl, Jonathan Leshnoff, Charles Osborne, Nick Page, and Benjie Ellen Schiller, Zamir will add continuity to the depth, breadth and beauty of Jewish music. Alumni activities throughout the season. Visit our alumni page for details. Join us as we celebrate 50 years of music with a mission! For further details, or to donate, contact manager@zamir.org.